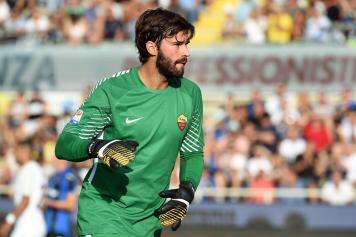 Serie A giants Roma are reportedly set to offer their goalkeeper Alisson a new, improved contract amidst interest from a host of powerhouse clubs, CalcioMercato understand. The 25-year-old has quickly emerged one of the best and the fastest improving goalkeepers in the Serie A since having joined Roma in the summer of 2016. He has impressed for his club this season as well, appearing 24 times in goal under Eusebio di Francesco. CalcioMercato can reveal that Roma want to hand the stopper a new deal to fend off interest from a lot of big clubs across Europe. In fact, the club is in talks with Alisson's entourage to negotiate a new deal that will hand him a 90 million euros release clause, which will rank him third behind Mauro Icardi and Andrea Belotti in terms of most expensive release clauses in Italy. The first to come in for Alisson were Liverpool and the duo of Real Madrid and Paris Saint-Germain are also his admirers. Reports in Spain are suggestive of a 50 million euros pre-contract agreement with Real, but that isn't the case. Bayern Munich too are casting glances at the Brazilian.